All rights reserved. 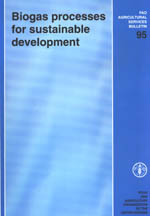 No part of this publication may be reproduced, stored in a retrieval system, or transmitted in any form or by any means, electronic, mechanical, photocopying or otherwise, without the prior permission of the copyright owner Applications for such permission, with a statement of the purpose and extent of the reproduction, should be addressed to the Director, Publications Division, Food and Agriculture Organization of the United Nations, Viale delle Terme di Caracalla, 00100 Rome, Italy. The role of blogas in improving rural development, environment and ecology. The effect of use on the nitrogen present in the biomass is discussed below. Economic analyses of cement biogas pits for household use in chinese rural area. Economic analysis of community biogas plants in China.